Barberry or berberis is a genus that encompasses a very large number of both evergreen and deciduous species. Around 450 to 500 barberry species have been discovered worldwide. 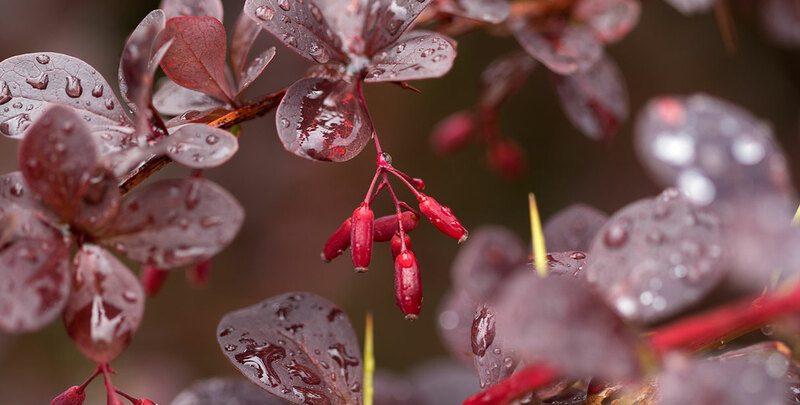 As a garden plant, berberis species are particularly popular for their edible red to dark blue berries as well as its elegant leaves and red or yellow flowers. Deciduous varieties, such as the Japanese barberry or berberis thunbergii have handsome red to purple foliage in the autumn. There are no evergreen species or varieties of berberis that are native to Europe, although some evergreens are extremely common in gardens all across Europe. The best known species in Europe is even named the European barberry, also known by its botanical name berberis vulgaris. Berberis species are widely in use for hedging purposes. Both deciduous and evergreen species are cultivated as hedging plants and the two groups are very much alike. Barberries are dense, thick shrubs that grow wider than they do tall, which makes them perfect plants for low hedges. They are often planted below windowsills, for instance. It has dark green, lance-shaped leaves and sharp thorns. There are several varieties that are commonly cultivated as hedging plants. They are all slow growers that create low, broad, formal hedges, as they form neat, dense hedgerows. However, these appealing plants are also ideal as border shrubs. 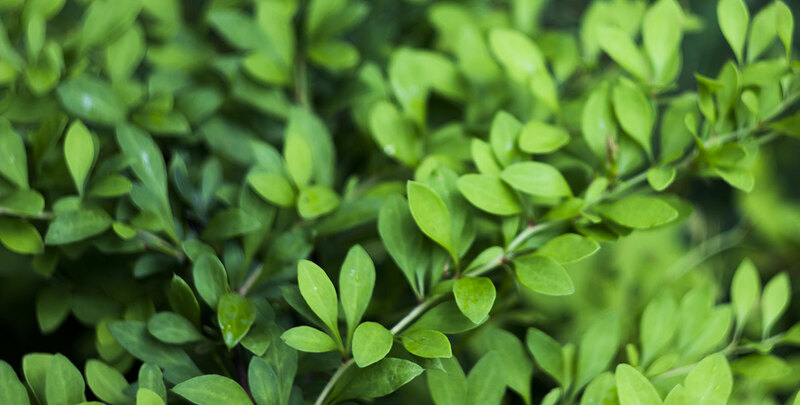 Thorny berberis hedges are almost impenetrable and are therefore a good choice for security hedges. Barberries can be found virtually everywhere in the world. They are closely related to the mahonia genus. So closely, that some botanists even consider berberis and mahonia to be parts of one and the same genus, as apart from the compound leaves of mahonia species and the thorns of berberis species, there are no consistent differences between the two. 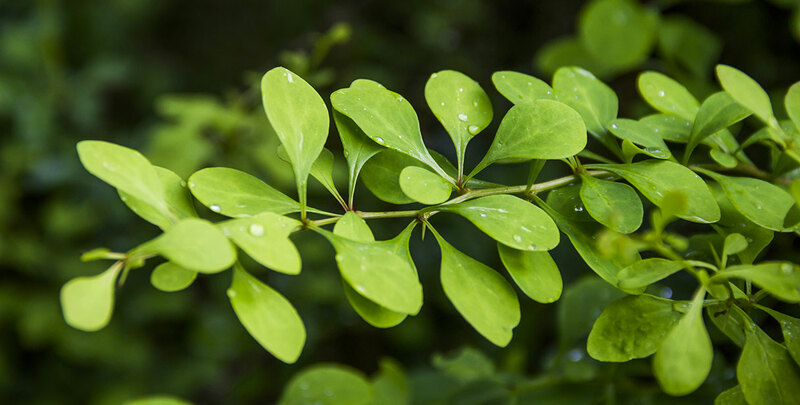 Most berberis species originate from South America, Asia or Africa, though there are deciduous species that are native to Europe and North America. The berries of this hedge plant are technically edible, but rarely enjoyed, as their characteristic bitter flavour is a bit of an acquired taste. There is still a culinary use for these fruits though, as they are often used to enrich the flavour of meat, fish or rice. In some countries, the barberry is banned from sale. This is caused either by the fact that barberries have a tendency to become invasive when they are planted outside of their native habitat or by its reputation of having a negative impact on the wheat harvest. The latter is only partially true, as barberries themselves are not poisonous. They do, however, play a part in the spreading of a certain mould that can cause mildew in wheat. Due to its reputation, barberry did not come into use as a hedge plant until fairly recently, as farmers were understandably reluctant to use a barberry hedge to enclose their farmstead. 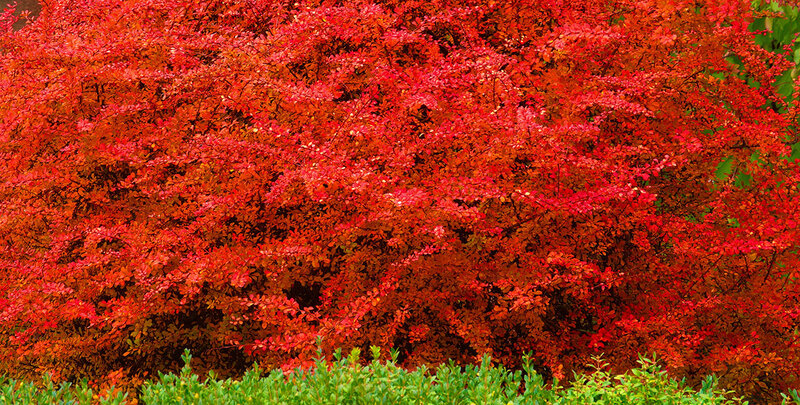 Their ornamental value, however, has been proven and therefore, barberry hedges are a welcome addition to any garden. Barberries thrive in the sun or shade – although some varieties strongly dislike full shade – and are quite easy to grow and maintain. Deciduous barberries are best grown in full sunshine, as this will positively influence their autumn colours. The species is generally tolerant when it comes to low temperature and soil types, as any well-drained soil will do. Barberry hedges are very tolerant of pruning and if you do so annually, a proper hedge is guaranteed. However, their thorns make pruning rather a difficult and painful job, so gloves are a necessity. The deciduous thunbergii varieties are to be pruned in the spring or early summer after flowering. If they are pruned too late, they will not have the time to develop leaves, which they need to be able to flower the following year. All the evergreen varieties, berberis frikartii 'Telstar' and 'Amsterlveen' and the warted burberry (berberis verruculosa), are best left unpruned. You can limit trimming to the removal of excess or dead branches and flowers after flowering is over. If you prefer a more informal hedge, it is even possible to let the hedge grow wild and only cut it after flowering during springtime. These varieties flower particularly well in the sun or semi-shade. These evergreens have primrose yellow flowers and dark blue berries, while the thunbergii will produce small, somewhat inconspicuous flowers and red berries. Barberries can reach a maximum height that ranges from 1.5 to 2 metres, which is why these types of hedges are not commonly used for privacy purposes. They make excellent low hedges though and they can be trimmed up to three times per year, resulting in an exceptionally neat hedge. Why Choose a Barberry Hedge? Regardless of whether you choose an evergreen hedge or a deciduous one, barberry hedges are a welcome, aesthetically pleasing addition to any garden. Due to its reputation for ruining the wheat harvest, they have no history of agricultural significance and therefore, berberis species have instead become genuine garden plants, so every barberry species mentioned here will be a good choice for your garden. Especially the cultivars that were specifically developed as hedging plants, such as the berberis frikartii, will certainly do well in any European garden. Maintenance may not be very attractive due to the sharp thorns of these plants, but it also does not take up much time, which makes the barberry a fairly low maintenance hedge plant and a good choice for anyone who would like a border hedge, rather than a tall privacy hedge.